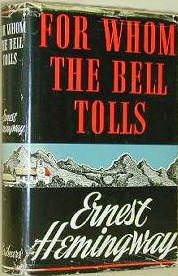 Last week, Maria Sans, who inspired Ernest Hemingway’s For Whom the Bell Tolls, died in Mataro, Spain at the age of 91. Set during the Spanish Civil War, For Whom the Bell Tolls tells the story of Robert Jordan, an American in the International Brigades, and his relationship with a volunteer nurse named Maria (who was inspired by Maria Sans herself). According to latino.foxnews.com, Sans “met the famed American writer in [Mataro] while working as a nurse at a hospital that treated members of the International Brigades.” Though she is no longer living, Sans’ spirit will endure in Hemingway’s timeless classic.